Although there are tons of materials devoted to the various aspects of creating of haunted house, one topic remains mostly ignored amongst all the how-tos on prop-making and setting up a haunted house: scaring people. Far too many people think simply wearing a mask and yelling “Boo” while jumping out of a dark corner is all you need to do in order to scare people. So when I discovered Living Dead Live! while perusing through Amazon, I was pretty excited. Especially because of the names I saw listed on the cover. 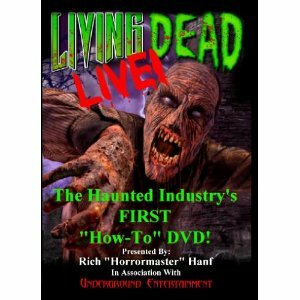 I was familiar with Jim O’Rear due to his acting work and presence in the Halloween/haunt community and Rich Hanf is a pretty big name in the haunted attraction industry. In fact, he is a professor at Halloween University! This was clearly put together by guys who knew their stuff when it comes to scaring. The film opens with Rich Hanf speaking outside his 2002 “House of the Living Dead” haunted attraction. He’s very energetic, animated and quick to make a joke, like an 80’s wrestling manager “cutting a promo.” We learn that this is actually a sequel to a video from 1997 called Live on Horror Hill and that, just like that video, we’ll be going through a haunted house, room by room, to examine how the scares are achieved. After a reprise of a gag from Live on Horror Hill (presented in a way that’s still funny to those who haven’t seen it), we get the opening credits. Said credits are played over footage of people getting scared as they go through the haunt, and certain footage is reused many times over the course of the film. Right from the beginning, Hanf shows the viewer how a scare can be used to force people in a certain direction. In this first example, he uses a rattling, chained-up door prop to startle people into running further down the hall at the beginning of the haunt. It’s positioned by the doorway that customers use to enter the haunt, and it doesn’t start moving until the customers are partway down the hall with their backs to the door. This is followed by footage of the scare in action, which occurs after the initial explanation of each scare. Oddly, the footage used for the next scare (involving a giant rat and a killer clown) only seems to show the clown scaring people. The asylum room is truly inspired and jam-packed with scares, featuring numerous instances of a single actor providing multiple scares. My favorite involves a jailed inmate startling someone by suddenly appearing in a cell and rattling the bars. This gets the customer to back up towards the opposite wall, which contains an actor behind a hidden drop panel. When the hapless victim turns around to see what made the loud noise behind them, the first actor removes the bars from his cell and starts to climb out. That way, when the customer(s) who get scared by the drop panel turn back around, they’re surprised by the freed prisoner coming after them and are forced towards the next scare. As our host notes, using scares to direct people are important, as it helps keep them from aimlessly milling about for too long and clogging up the flow of customers. A still from reading “Words from the Press” takes us into a long segment featuring numerous clips of local news footage promoting “House of the Living Dead.” These are frequently mind-blowing, featuring things like a newscaster in bleeding “Jason” mask, multiple uses of Michael Jackson’s “Thriller,” and a segment where things keep popping out of walls until the room fills up like a reverse clown car. It’s all gloriously bizarre, although watching all of the clips does give away a large portion of the attraction. All of this footage appears to have been recorded at home although certain flaws, like the very high contrast footage featuring Rich Hanf’s wife seems to be the fault of news crew and not the people behind the DVD. There’s also one segment where the footage seems to “flash,” but I can’t say if it’s an error or merely an attempt to simulate a strobe light. Then we’re taken back to the scare tips and explanations. More creative misdirection scares are discussed (the ones in the haunted mine and hanging room are truly brilliant), as are the psychological effects of black curtains, the importance of showmanship, and what sort of scares to use for promotional news shoots. singling out a person to get them more involved in the experience. After that, the viewer is taken on the final leg of the haunt break-down. There’s plenty of old standards, such as a graveyard, strobe room and laboratory, along with more original material like the “Hall of Doors” (the scares aren’t as obvious as they sound). Of course, the old standards always have a new twist, such as how the mad scientist is able to get multiple scares at once. But wait, there’s more! Before the credits roll, there’s a ton of videos of people going through the haunt and some interviews with scared customers. It’s interesting to see how the character in some rooms are rotated and seeing some actors do scares that weren’t previously mentioned by Hanf. The customer reactions are, as you’ve probably guessed, quite a hoot. All the classics are here, from people losing shoes to people who go in acting brave getting scared silly. (there is a funny joke about this on the back cover), which is a shame since the news footage segment could have easily served as a bonus feature without removing essential from the film. But, in all fairness, this appears to have been the first time those involved had ever released a DVD. The transfer is full frame, camcorder quality with the occasional rainbow/tape lines and artifacting. To be honest, the quality doesn’t both me, as I find it much less annoying than flat, overly bright Mini DV transfers you see on direct-to-video crapfests like The Tomb. What did annoy me, however, were the longish black pauses between haunt footage and Hanf’s segments and the squeaking noise that first appears several minutes into the movie (and occasionally pops up later on). I asked Mr. O’Rear about this and sadly, this was present on the master copy. He was not sure as to exactly what caused it, but theorized it could have something to do with a low battery. Unfortunately, it pops up at points where simply removing that portion of the audio track and replacing it with ambient noise or redubbed dialogue would be impossible (as would simply not using that footage). The same can’t be said for the long breaks between footage transitions, however. That really should have been fixed in post-production or, failing that, replaced with graphics outlining the scare tips made from the previous segment (not unlike the scrolling subtitles from time to time to emphasize a point or provide further hints). Another thing that could have been taken care of in post is the order of the segments, as the constant breaks from the main dissection of the attraction’s scares is rather distracting. In my opinion, it would flow much better in the following order: step-by step through the haunt, actors, live haunt footage and maybe the news promos (if they weren’t used as an extra). Any other issues can mostly be chalked up to Living Dead Live! As this was more or less made by two guys using only one camera on the final night of the haunt’s run (Halloween), there was no time for multiple takes. Thankfully, Rich Hanf rarely flubs his dialogue and those are limited to the interviews with performers. And even then, the others (including cameraman Jim O’Rear) seize upon the opportunity for some good-natured joking. Likewise sometimes the camera angles used during the “live” footage might not be to everyone’s taste, but the fairly narrow portions of the haunt were designed to keep scared customers moving forward and not for filming. Especially filming by a cameraman who was taking care not to get in anyone’s way. Although primarily intended for those already familiar with the haunted attraction biz, home haunts can still pick up some great tips from this. However, the entertainment and educational value is marred somewhat by the presentation. Thankfully, that’s nothing that couldn’t be fixed by a little editing and a “Living Dead Live: Reanimated!”-type reissue of the title. Special thanks to Jim O’Rear for the review copy!